Mimaki UJF-6042, an LED UV inkjet flatbed printer with maximum printing dimensions of 610 x 420 mm. It can be used to print on a product, as well as to print product packaging. Mimaki CFL-605RT cutting plotter supporting on-demand production with multiple functions, including cutting and creasing of packaging material and cutting of package cushioning. To create a package design, the user simply selects one of the 400 professionally-designed templates included with ArtiosCAD DS, enters the inside package dimensions and thickness of the media to be used. More detailed parameters as well as shapes and sizes of flaps can also be specified. 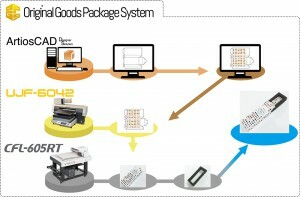 The system then creates a package design file that can be imported into Adobe® Illustrator® to add graphics . Users can also use specialized tools to create their own custom designs and include them in the final design. The system offers a total solution not only for the design and creation of product packaging and cushioning but also for printing directly onto a product. Users that don’t need the predesigned templates available in the ArtiosCAD DS software, can create custom designs with the guide function. The Original Goods Packaging System (OGPS) is available from resellers and distributors as an option to the CFL605RT cutting plotter from Mimaki. Esko (www.esko.com) is headquartered in Ghent, Belgium and is a global supplier of integrated solutions for packaging and labeling, sign and display, and commercial printing and publishing industries. In order to enable this function, users must download the free plug-in “Esko Data Exchange” from the Esko website.